‘The Mark of the Rani’ is something of an underrated Doctor Who story, light on plot and eventually falling into pantomime territory but also making for an excellent debut for the villainous Time Lady the Rani while also portraying the bombastic and argumentative Sixth Doctor in his most heroic and compassionate light yet. With the inclusion of the Master in a more subservient and subsidiary role as well, ‘The Mark of the Rani’ does sometimes feel like it has a lengthy list of certain things it is trying to achieve and incorporate, but the facetiousness and cheekiness of the script remains a highlight that manages to serve as a beacon of optimism and levity within an ever more dangerous universe. This is a far from perfect characterization for the Sixth Doctor, but ‘The Mark of the Rani’ makes significant strides in toning down the overwhelming brashness and arrogance that has come to define the character in his early stories. He regularly interacts with Peri in a fashion that isn’t completely demeaning even while he revels in taking the opportunity to teach her a lesson, but he also shows remorse at the plight of the ordinary people around him who are so affected by the Rani’s deviousness. With Colin Baker firmly in the centre of the action, this is the second consecutive serial that hints at what this era and its lead could have achieved even if the script itself is far from flawless. Even if Peri herself suffers from some less than intelligent moments, it’s hard to deny that- against all odds given how confrontational the characters have been- there is a strong chemistry between Baker and Nicola Bryant underlying each scene they have together. Kate O’Mara is superb in her first appearance as the Rani, and it ends up being quite a brilliant choice to have the Master alongside her even though she proves that she’s more than capable of carrying out her plans without his assistance. Instead, the Master’s presence provides the opportunity to directly contrast the two rogue Time Lords while calling the Master’s often senseless and over-complicated schemes into question. The Rani’s forced exile drives her, and her dangerous determination is never doubted as she regards everyone around her as a nuisance that can be disposed of at a moment’s notice. Whereas the characterization of the Master has become somewhat muddled since Anthony Ainley took up the role, the Rani instantly proves what a strong villainess she can be, highlighted by the ample praise for her intelligence the prickly Sixth Doctor heaps upon her. Strangely, the story decides not to do too much with the Rani’s experiments after setting them up to be so important, the notions of changing history or at least of using the knowledge attained to change events on the planet she rules seemingly forgotten as the three Time Lords instead undertake a game of constant oneupsmanship. 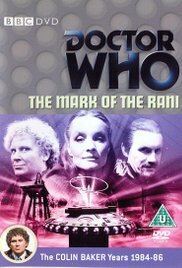 Despite what becomes a frivolous plot, though, ‘The Mark of the Rani’ still manages to succeed as a character study of the potential burgeoning relationship between the Doctor and Peri, especially when contrasted to that between the Master and the Rani. With a strong guest cast and an evocative beginning bolstered by some excellent location footage showing the regular people in their regular routines, ‘The Mark of the Rani’ has a surprising amount going for it and wonderfully introduces another villainous rogue to Doctor Who’s long roster.